The problem was not the local provider nor the content. We could have taken the site tour for half this price had we directly purchased the tickets from the provider versus Viator. Very interesting day. The guide for the tour was extremely good, with a mix of history and a little bit humour. The grounds are beautiful and peaceful, hard to imagine the severe hardship of convicts. Nice small cafe to sit and relax a while. If planning to spend one day there, the entry site pass provides you with a guided tour a must, free access to all on mainland and a guided boat tour of around the islands e.g. Isle of the dead. Could easily spend two days there one was all we had time for....a unique experience. The drive to Port Arthur was also full of breathtaking views if you take the few minutes to drive off the main roads for some truly breathtaking views. Very happy with the whole day. Really enjoyed the boat building and blacksmith area with sound effects. Loved the cruise but wished we had booked the the Isle of the Dead. The talk was informative and helped us navigate our way around. We will return again because of course we did not leave enough time. Well worth the visit. Definitely need more than one day to see it all. Walking tour very informative, had a great guide. Had the most amazing time here,there is definitely a "feeling' ,we were really moved by all the different levels of history here not to mention the natural beauty. 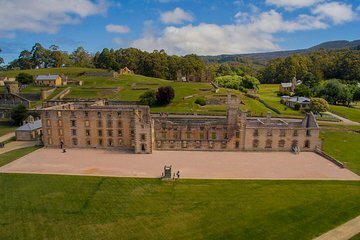 We enjoyed our visit to Port Arthur Historic Site, which included a guided short walk and a short cruise. You could see most of what's on offer in one full day or break it up over two days as we did. The Bronze ticket price (which is the cheapest available and what we bought through Viator) is available as a two day pass only. We had a lovely time there.